Every year around Pioneer Day I like to theme singing time around Pioneer Day (never heard of it Pioneer Day? It's Utah's state holiday on July 24th commemorating when the first pioneers arrived). Now, I know LOTS of choristers are not from Utah so why would you celebrate it? In my opinion, it never hurts to learn about our church's history no matter where you live. The early saints made personal sacrifices for the church. Their sacrifices not only helped the church grow, but helped them gain stronger testimonies. Just like the pioneers, if we make sacrifices for the gospel, our testimonies will in turn grow. 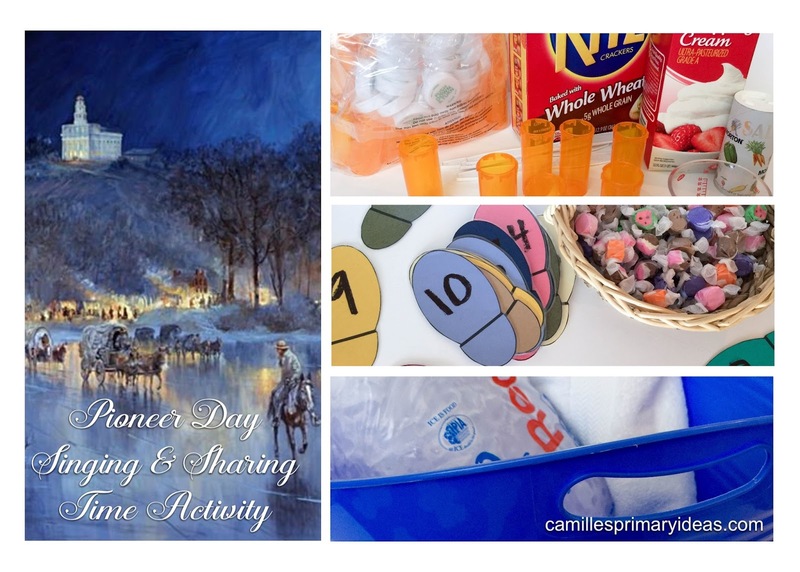 I have several Pioneer Day lesson plans I've done over the years all found HERE. This year, I dusted off my joint singing & sharing time activity found HERE. It's a little more labor-intensive (but I thought it would be appropriate since Pioneer Day lands on Sunday this year) and requires coordinating with the presidency member teaching sharing time so if you are just starting to plan for singing time this Sunday, I'd probably opt to choose something else from my list ;). So Happy Pioneer Day - whether you live in Utah or not!